China reacted with fury after the U.S. Senate passed the Taiwan Travel Act on Wednesday, condemning it as a serious violation of the “One China” principle and stepping up its efforts to isolate Taipei. The Taiwanese interpret some of China’s warnings as threats of military action. The Taiwan Travel Act passed the Senate unanimously on Wednesday, after passing the House in January. The White House did not immediately confirm that President Donald Trump will sign the bill, although he has been friendly to Taiwan throughout his administration, to the frequent consternation of China. 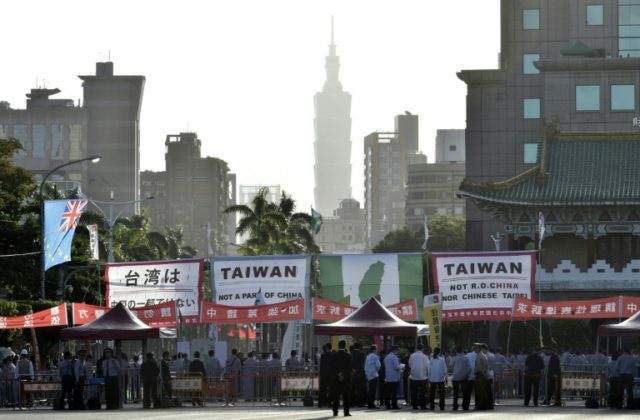 Ever since the Taiwan legislation was taken up by the House of Representatives, China has issued a steady stream of warnings that passing the bill would increase tensions between Beijing, Taipei, and Washington. The bill makes it easier for U.S. and Taiwanese officials to visit each other’s countries, something China believes will confer an unacceptable level of legitimacy on the Taiwanese government by treating it as a sovereign power, rather than a province of China. Even Taiwanese opposition politicians applauded the passage of the bill, largely confining their criticism to warnings that expectations should not be raised too high as it will take time to implement the changes envisioned by the legislation, and Chinese opposition must be taken into account. China’s opposition was fiery indeed, with the strongest restatement yet of Beijing’s talking point that the Taiwan Travel Act violates the sacred “One China” principle. “China is strongly dissatisfied with this and resolutely opposes it, and has already lodged stern representations with the U.S. side,” Chinese Foreign Ministry spokeswoman Hua Chunying said on Thursday. Reuters notes that Chinese apprehension over Taiwan began mounting after the election of President Tsai, who was seen as more independence-minded than her predecessor, and spiked this week after two former Taiwanese presidents called for an independence referendum this year. This call was issued on the same day the Taiwan Travel Act passed the Senate. In the most recent statement, China’s Taiwan Affairs Office said the bill was a serious contravention of the “One-China” principle which is the foundation of U.S.-China ties. “We sternly warn Taiwan: not to rely on foreigners to build yourselves up, or it will only draw fire upon you,” the office spokesperson said in a statement, directly threatening Taiwan and its officials. In a strong and direct editorial, the state publication China Daily mentions its fear of Taiwan pushing for independence once the bill becomes law, which would then force Beijing to act with force to bring Taiwan under its control. “If she (President Tsai Ing-Wen) persisted, it would lead to the inevitable consequence of triggering the Anti-Secession Law that allows Beijing to use the force of the military to prevent the island from seceding,” the paper said. “Since the US is bound by domestic law to act on behalf of the island in that instance, it would only give substance to the observation that the descent into hell is easy,” the paper continued. The Global Times has been a veritable geyser of belligerent anti-Taiwan editorials and expert analyses ever since the Taiwan Travel Act passed the Senate. The same editorial that argued crushing Taiwan would be fairly easy for the new and improved PLA also attributed the Taiwan Travel Act to “growing nationalist sentiment in the U.S. in the face of China’s rise,” but then dismissed the bill three paragraphs later as an expression of elitist anti-China sentiment that Trump had best ignore if he wants to win another populist victory in 2020. Another Global Times piece quoted China Foreign Affairs University professor Li Haidong denouncing the Taiwan Travel Act as an “irresponsible move” that “reverses the gears of a stable and positive Sino-U.S. relationship,” bringing Washington and Taipei perilously close to crossing a “red line” Beijing will enforce with the Anti-Secession Law—in other words, by invading Taiwan. Li added a warning that the United States had better start seeing things China’s way if it expects continued Chinese cooperation on the North Korean nuclear crisis. Yet another Global Times article quoted An Fengshan of the Taiwan Affairs Office suggesting “unscrupulous” Taiwanese media and U.S. think-tank experts are hatching a plan that will sacrifice Taiwan in a desperate U.S. bid to weaken China, even as the Chinese generously extend wonderful educational and economic opportunities to the people of Taiwan in a spirit of brotherly cooperation that might end very suddenly if Taiwan does not adjust its attitude. Here again, Chinese spokesmen are pushing the talking point that elites in Taiwan and America are dishonestly pursuing a dangerous strategy that the good people of both countries would not support willingly. “It is highly unlikely that the U.S. will send top-level officials to Taiwan as it would be seen by Beijing as crossing the red line,” agreed Phillip Yang of the Taiwan Association of International Relations, who suspected President Tsai would avoid making any dramatic visits to Washington for the same reason. Yang suggested Congress’s passage of the Taiwan Travel Act could give President Trump leverage in his dealings with Beijing, as he could float the possibility of vetoing it, or more likely use administrative discretion to refrain from arranging the kind of official exchanges that threaten Beijing.